Billy, a former player, trainer, coach, manager, and physiotherapist died forty years ago today at the age of 71. He had been ill for some time and the tributes simply poured in for a man who had contributed far more to Burnley Football Club than those of us watching from the outside could ever know. He was a real football man; his dad was a centre half with Nelson in the 19th century and two of his three sons went on to play football. His eldest son Neil was capped by Scotland as well as playing for Birmingham and Plymouth whilst second son Jackie played for Pegasus, a top amateur club at the time. A former Burnley player whose career was cut short by injury, Billy returned to the club in the early 1930s as reserve team trainer and it was then he met up with Ray Bennion and the two of them went on to form a partnership that was a major influence in the resurgence of our club in the post war years. 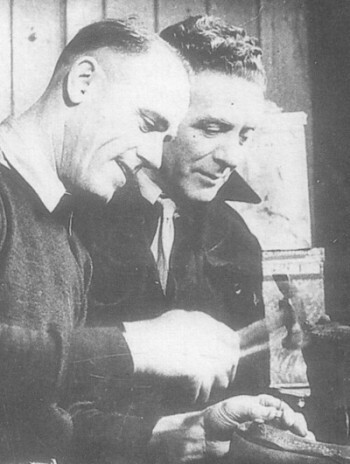 Billy was promoted to first team trainer on the retirement of Charlie Bates, and that's the role he carried out, working with the managers and his close partner Bennion, as Burnley won promotion in 1947 and went on to build a side ready to take English football by storm. He was briefly in the manager's chair himself and on his appointment said he would be one of the honest managers in the game. Ill health forced him to resign just a few short months after taking over, but he recovered sufficiently to return to the club as physiotherapist, with new manager Potts claiming his presence at the club, alongside Bennion, was vital. Chairman Bob Lord said on hearing of his death: “There is no doubt that Bill Dougall has been a most capable, devoted, loyal and conscientious member of Burnley Football Club during the whole of his forty years at Turf Moor. Many players have passed through his fingers, so to speak, and all of them have cause to thank him very much. “He was endeared by all who were privileged to know him and he will surely never be forgotten. He was a great player and as a trainer-coach was also absolutely outstanding. Besides Neil and Jackie, Billy Dougall also left one other son Bill and a daughter Ella as well as his wife Jeannie who survived him by many years. All Burnley FC's directors, staff and players attended the Requiem Mass with Alex Elder, John Angus, Gordon Harris, Andy Lochhead, Brian Miller and Dave Merrington as bearers. Billy Dougall – his family today will be remembering him forty years on from his sad death, I think we should all spare a moment to remember Billy Dougall today, Burnley's guiding light and inspiration. This article was originally published on 15th November 2006 and is now reproduced five years later on the occasion of the 45th anniversary of Billy Dougall's death. Subsequent to the original article, in July 2009, I had the opportunity to discuss Billy Dougall with former Claret Jimmy McIlroy. He told me that he learned more about football from Billy Dougall than anyone else througout his career.